Easter Sunday Sermon: "Just the Facts"
We should expect the same on Easter Sunday. After all, Jesus death and resurrection for you is a matter of fact – the tomb is empty. Jesus died. Jesus rose, just as he said he would. These events really happened in history. And these facts are also the foundation of our Christian faith. Jesus was put to death for our sins and raised for our justification. Your faith in Christ is founded on the fact that Jesus suffered, died, and rose for you. And yet it should come as no surprise that these facts are contested or treated as opinions, fantasies, or worse yet, lies. Perhaps you’ve heard it said, “Faith is a fairy-tale, like the Easter bunny or leprechauns.” Or, “Jesus was a good teacher or moral guide, but his resurrection is just some legend cooked up by the disciples to get rich and famous.” And then there’s the internet; it’s full of blogs and videos claiming Christianity is just a reboot of the old Egyptian, Greek, or Roman myths, second in popularity only to cat videos perhaps. Now, all of that would be true…if Jesus did not rise from the dead and his tomb was not empty. For if Jesus did not rise from the dead, then our preaching is in vain and so is your faith. If Jesus did not rise, then Christianity is no better than a pint glass full of foam and no beer. If Jesus did not rise from the dead then the New Testament is a lie, the apostles are frauds, and every Christian preacher for the last two thousand years - including this one – are nothing but big fat liars. More than that, if Jesus did not rise from the dead we are misrepresenting God; we’re all a bunch of fakes, phonies, and crooks. If Jesus did not rise from the dead, then our faith is futile and we’re all wasting our time here this morning. We should all enjoy the Easter breakfast and go home or go the beach. Eat, drink, and be merry. If Jesus did not rise from the dead, then all his promises to forgive our sins are also worthless, and we’re still in our sin. No grace. No mercy. No hope. Nothing. As St. Paul says in 1 Corinthians…If in Christ we have hope in this life only, we of all people, are most to be pitied. And then in three little words, Paul drops a fact bomb on all our opinions, conjectures, and baseless assertions. But in fact, Christ has been raised from the dead, the first-fruits of those who have fallen asleep. This fact is the ground of our faith – on Easter, and every other day of the year. The Christian faith isn’t founded on fairy tales, opinions, or ancient legends, but fact. 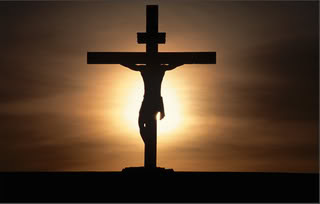 Unlike any other religion in the world, Christianity is based on a particular set of facts: Jesus who is true God and true man was conceived by the Holy Spirit, born of the Virgin Mary, suffered under Pontius Pilate, was crucified, died, and buried on a Friday afternoon and rose again from the dead three days later. And because Jesus rose again: Death is dead. Death has lost its sting. The last enemy has been destroyed. And sin has lost its hold over you. Victory has been won. Rejoice! 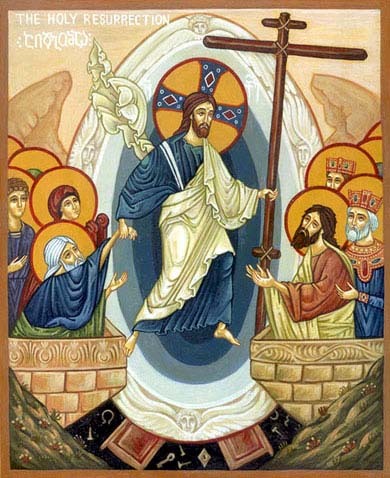 Christ is risen from the grave and in him you will rise too. For as in Adam all die, so also in Christ shall all be made alive. Jesus dies and you live. Jesus lives and you will never die. Jesus did all of this for you, and that’s a fact. It’s true… if Jesus did not rise from the dead, then Christianity and our faith crumbles. But in fact, Christ has been raised from the dead. Your faith in Christ is founded on the fact that Jesus suffered, died, and rose for you. But in fact…Christ died for our sins according to the Scriptures. He was buried. He was raised from the dead on the third day according to the Scriptures. But in fact…The tomb was empty. The burial linens were folded and neat. The guards were bribed to say the disciples had stolen the body. But in fact…Jesus was seen by Mary Magdalene, by Peter and the other disciples, by Thomas who confessed “My Lord and my God,” by two disciples on the Emmaus road, by seven disciples who ate fish with Him, by over 500 brothers at one time, by James and all the apostles, and by Paul on the road to Damascus. But in fact…These were not dumb hillbilly fishermen. They were smart, sane, rational people who went from not believing that Jesus had risen from the dead to believing. They had everything to lose and nothing to gain from their testimony. Many of them even lost their lives confessing the fact of Jesus’ resurrection. But in fact…On the first day of the week, at early dawn, they went to the tomb, taking the spices they had prepared. 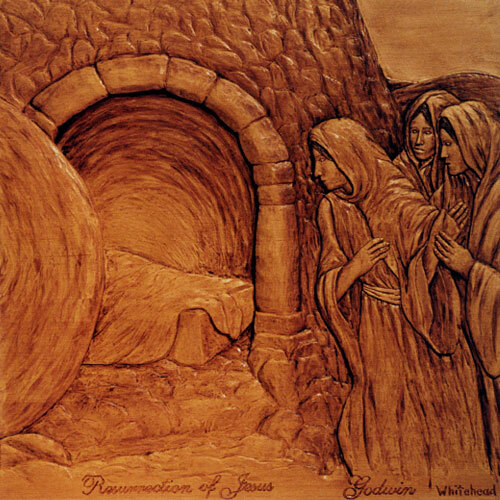 And they found the stone rolled away from the tomb, but when they went in they did not find the body of the Lord Jesus. While they were perplexed about this, behold, two men stood by them in dazzling apparel. And as they were frightened and bowed their faces to the ground, the men said to them, “Why do you seek the living among the dead? He is not here, but has risen. There they are. Just the facts. All for you. Good Friday Sermon: "Behold Your King"
Are you the King of the Jews? Pilate asked Jesus. Where is the one born King of the Jews? The wise men asked Herod. From Herod’s halls to Pilate’s headquarters, this question unites Jesus’ birth and death. And that’s no accident. Why do we have Christmas? Why the joy and the feast for the newborn king? Because of this day – Good Friday. After all, Christmas Day – December 25th - will be celebrated just 9 months from today, March 25th. Puts a bigger perspective on that little manger doesn’t it. Behold your King: born for you. Lived for you. Crucified for you. The kings of this world – more often than not – rule for themselves. We see that in Herod and Pilate. But do not be fooled. There’s a little Herod and Pilate in each of us. Our heart is a throne room, ruled by a want-to-be-king; and our who desires is to rule over others, to serve only ourselves, and to have everyone and everything obey our whims and ways. If I were King for a day…we say. We poor sinners are full of such delusions of grandeur. We are not kings, but slaves to sin. Kings of nothing. Thankfully for you, King Jesus does the opposite of what we would do; he does the unexpected. He is betrayed. He is mocked. He is spat upon. He is beaten. He is rejected. He is denied. He dies. He lays down his life. He is buried. And then he rises again. All for you. His Kingdom may not be of this world, but it comes to us in this world. You are made an heir of heaven in Holy Baptism, covered in the robe of Christ’s righteousness that covers all your sin. You are given the King’s sacred decree: your sins are forgiven. You dine on the finest of foods and wine in the royal banquet of Jesus’ body and blood. The kings of this world enter a city riding atop a warhorse bearing the battle sword. But Jesus rides into Jerusalem on a donkey with palm branches. Hosanna! Blessed is he who comes in the Name of the Lord, even the king of Israel. The kings of this world are robed in royal garments, wear golden crowns, and wield an iron scepter. But Jesus is wrapped in purple robes of mockery, crowned with thorns, and given a reed to reign in his humility…all for you. The kings of this world seek glory in might and power, wealth and riches. But Jesus reveals his greatest glory in weakness and suffering on the cross. He gives us great wealth, though not with gold or silver, but with his holy precious blood, and his innocent suffering and death. He empties himself to fill you. He humbles himself to exalt you. He becomes sin to make you righteous. He dies and you live. On Good Friday we finally get the answer to the magi’s question. Where is the one born King of the Jews? He is crucified for you. The same boy who cried out for his mother as an infant now cries out on the cross to save us: It is finished! On Good Friday we also hear the answer to Pilate’s question. Are you the King of the Jews? Pilate took Jesus and flogged him. And the soldiers twisted together a crown of thorns and put it on his head and arrayed him in a purple robe. They came up to him, saying, “Hail, King of the Jews!” and struck him with their hands. And not only of the Jews, but for the whole world. For you. Today Jesus is crucified for you. In three days Jesus will rise again for you. 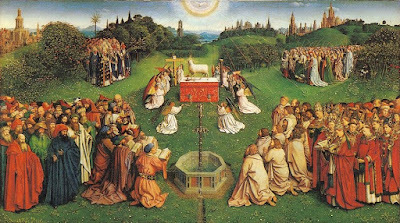 Maundy Thursday Sermon: "Behold, the Lamb of God"
Holy Week begins with a procession. Crowds gathered. Palm branches waved. Jesus rode atop a donkey. And the walls of Jerusalem echoed with shouts of “Hosanna, blessed is he who comes in the Name of the Lord”. All as Jesus makes his way to the temple. Behold, the Lamb of God who takes away the sin of the world. Every year, all the one year-old male lambs without blemish made the same procession. A Lamb for a household, the Lord said in Exodus. And so it was. The Paschal lambs, the suffering lambs, were shepherded from their flocks outside the city, through the gate, and up to the temple for the Passover sacrifice. Blood was shed. Blood was painted on the doorposts. The blood shall be a sign for you, on the houses where you are. And when I see the blood, I will pass over you. Then the Lamb was roasted and eaten. Death passed over once again. For Jesus, Holy Week ends as it began, with a procession. Jesus gathered his disciples in the upper room. They ate the Passover together. Jesus prayed in Gethsemane. Judas led the soldiers to Jesus and the procession continued on to the temple courtyard, to Pilate, and finally outside the city walls, up the hill, onto the cross, and into the tomb. And unlike the thousands of Passover lambs slaughtered during the feast, this Lamb is slain and yet lives. All for you. Truth be told, this procession is a long time in the making. This procession began long before Palm Sunday and the Exodus. It began in a garden with a betrayal. No, not Gethsemane, but Eden. The serpent lied. Adam and Eve ate and disobeyed. And the procession that began in joy ended in dreadful curse, bitter tears, and the agony of death. Their eyes were open and they knew not only good, but evil. But the Lord did not lead them out of the Garden naked and ashamed. The Lord God made for Adam and his wife garments of skin and clothed them. Blood was shed. A sacrifice of mercy in place of their sin. In a way, this was the very first Passover. Was it a year-old lamb without blemish? Perhaps it was. Behold, the lamb of God who covered the guilt and shame of Adam and Eve. Many years later, YHWH promised Abraham that from his offspring would come the one who would bless all people. But then the Lord commanded Abraham to make a procession of his own. Take your son, your only son Isaac whom you love, and go to the land of Moriah, and offer him there as a burnt offering. Abraham and Isaac marched on to the mountain. Isaac carried the wood on his back. Abraham had the fire and the knife at the ready. Where is the lamb for a burnt offering? God will provide for himself the lamb for the burnt offering, my son. And he did. First on Moriah and then on Calvary. Behold, the ram of God caught in the thicket, who gave his life in place of Isaac and the promised lamb to come. God’s promise to Abraham came true. His offspring became a great nation indeed. But their procession was halted for hundreds of years in slavery in Egypt, until the Lord sent a lamb. It was the 10th and final plague. All the first born in Egypt would die, unless the blood of the Passover lamb covered the doorposts of the home. It is the Lord’s Passover. Israel ate in haste. They painted their doors with the sacrificial blood. And they remembered the Lord who was about to deliver them from slavery in Egypt. Behold, the lambs of God who gave their blood so that death passed over Israel. Centuries later the procession moved on from the wilderness to the kingdom of Israel. And once again, the Lord promised a lamb by the mouth of his prophet, Isaiah. Like the first Passover lambs, this lamb would be a suffering servant. Unlike the first Passover lambs, he would also bear the flesh and blood of Adam. A man of sorrows. One acquainted with grief. Despised. Rejected. Yet, he has borne our griefs and carried our sorrows; he was wounded for our transgressions; he was crushed for our iniquities. Like a lamb led to the slaughter, and a sheep before its shearers is silent, so he opened not his mouth. 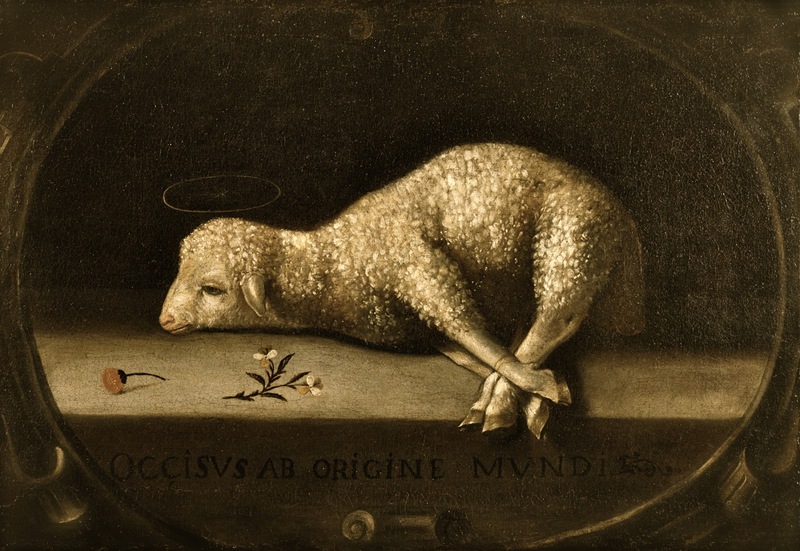 Behold, the Lamb of God who was stricken, smitten, and afflicted for you. Tonight we also make a procession, not to our death. Jesus has taken care of that for you. No, tonight, we process to our life, to the one true Passover feast. Up to the altar. On our knees. It is a holy feast of holy food. The Lamb’s flesh is given to you. Take, eat. 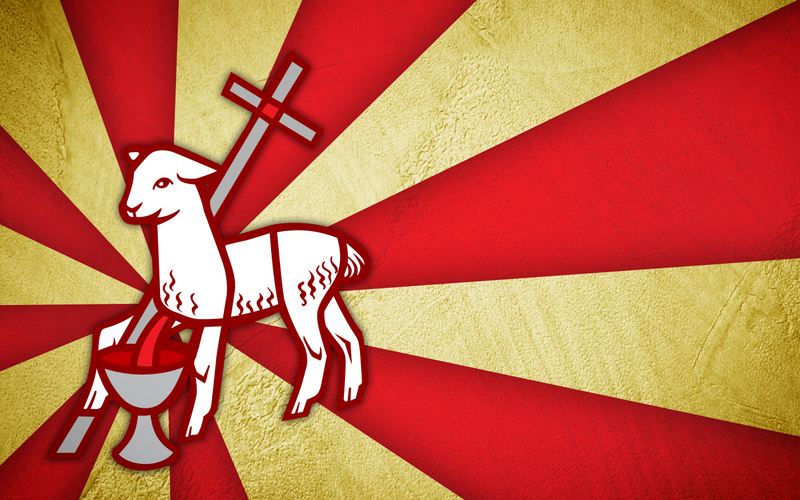 The blood of the Lamb is poured out for you. Take, drink for the forgiveness of all your sins. Tonight, death passes over you and onto Jesus. Jesus is the Lamb without blemish. Jesus is without spot or stain. He is here for you. Behold, the Passover Lamb of God who gives his flesh and pours out his life-blood for you. Lenten Midweek Sermon: "I AM the Resurrection and the Life"
Notice a pattern? I do, and I don’t think it’s a coincidence. 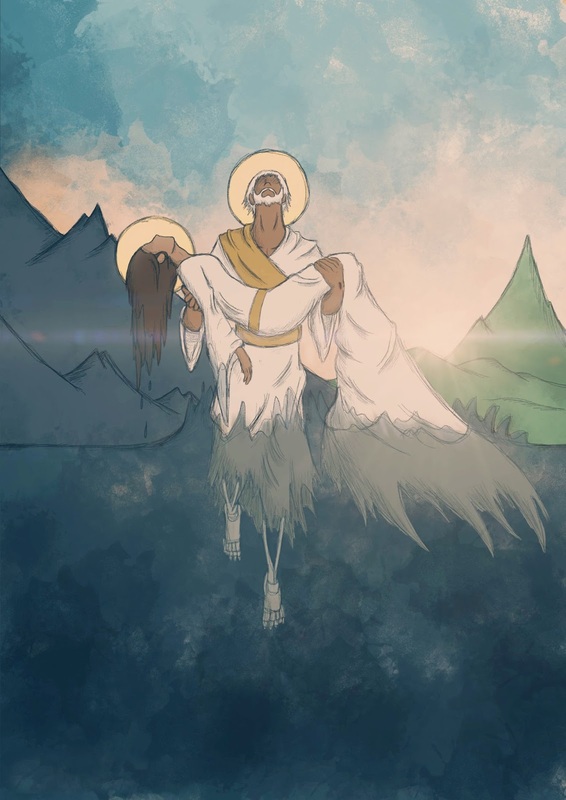 It seems that everywhere we look, even in our favorite books, movies, and music, people are battling the three-headed dragon of guilt, suffering, and death. And out of those three, Death is the ugliest of the monsters. Take for example, how non-Christians approach funerals and dying, or the recent death with dignity law passed in California, even our silly obsession with skull and cross-bones on cars and clothing reveals a simple fact. People are more afraid of death than ever before, and are willing to go to great lengths to cover up their fear. No wonder St. Paul writes, the last enemy to be destroyed is Death. It shakes us to our core. We’re left weary and broken, wondering who can put us back together again. Lord, he whom you love is ill.
Usually, our first instinct is to run to help the sick person. Call the advice nurse. Make an appointment. Get to the ER if necessary. Somebody, do something! But what does Jesus do? Now Jesus loved Martha and her sister and Lazarus. So when he heard that Lazarus was ill, he stayed two days longer in the place where he was. Rather unexpected, don’t you think? Jesus waits to go see Lazarus until after he died. Why? Listen to John’s commentary: Jesus loved Mary and Martha. Jesus could have quickly rushed to Lazarus’ bedside, healed him, and shown that disease and the all the doubters who was boss. Yet, because he loves Martha, Mary, the disciples, and you, he waits to show us all something greater. He waits in order to show the disciples, Mary and Martha, and all of us that we are not alone in our suffering, guilt, and death. This is why Jesus is born, why he’s headed to Jerusalem: to bear our sorrow, our sin, and to give us life in his death. So, Jesus waits to draw us – with all our guilt, suffering, sin, and death – to his dying and rising for us. Lazarus has died, and for your sake I am glad that I was not there, so that you may believe. It may sound callous at first but it’s not. Jesus reveals his loves for the disciples, and Mary and Martha, and us: he waits in order to reveal what could not be revealed in any other way; that he, Jesus, is Lord of all, even death itself. Illness, guilt, suffering, and death are no match for Jesus. Jesus waits that we may trust in him, even in the face of our guilt, suffering, and death – and look to him alone for rescue. Still, the disciples didn’t quite get it. Of course, they wouldn’t understand until after Jesus’ resurrection. We’re no different, really: apart from Jesus’ death and resurrection, Lazarus’ death doesn’t make much sense. And more than that, guilt, suffering, and death – our own and others – doesn’t make much sense either, unless we see cover our naked eyes with the clothing of Christ Crucified and risen for us. Lord, if you had been here, my brother would not have died. But even now I know that whatever you ask from God, God will give you. Haven’t we all uttered that prayer: Lord, if only you had been there. Sometimes it’s a guttural scream – the great NO! of pain - in the face of death. Other times, we pray silently, thinking our pain is far too overwhelming to bear, let alone speak about out loud. Jesus doesn’t chastise Martha for this. He bears her grief as he does yours. Jesus doesn’t even lay on the law: if only you had prayed harder, if only your faith had been a little stronger, if only you truly believed. No, none of that. Those are awful things to say to someone who’s grieving. The answer to guilt, suffering, and death isn’t more law. Like us, Martha needed the good news. And Jesus gives it. Your brother will rise again, Jesus said. Jesus makes it sound easy, like someone who simply says, “I’m going outside to dump the trash.” Of course, for Jesus, rousing Lazarus and you and me from our graves will be that easy. Arise! And it will happen. Martha replies, I know that he will rise again in the resurrection on the last day. Grief mixed with faith and hope. That’s the Christian way of mourning as well. Unlike the world who sobs and wails uncontrollably at funerals, we grieve, but not as others do in despair and hopelessness. For we have hope in the midst of sorrow, joy the midst of tears, life in the face of death. Unlike the faith of unbelief that looks only on death as an empty void, a return to nothingness, and part of the circle of life, Christians see death as the horrible consequence of sin, and yet a portal; our graves have been hallowed by Jesus who rested in our tomb. Death is destroyed in Jesus’ death. And after a short slumber Jesus Lord will awaken us as easily as he did Lazarus. Jesus’ salvation for you is always present tense and future promise: today you will be with me in paradise. And then, to show that his words do what they say, Jesus goes to Lazarus’ tomb where the words he just proclaimed - I AM the resurrection and the life – take place before their very eyes. This is why Jesus is in Bethany, why he’s on his way to Jerusalem – for Lazarus, Mary, Martha, the disciples, for you and for the world. To swallow up our guilt, suffering, and death by his own death. Jesus takes our guilt and declares you innocent instead. Jesus takes our suffering and all our problems of pain and replaces it with true joy and consolation in his cross and empty tomb. Jesus takes our biggest, baddest enemy – Death – upon himself, wrestles him to the death, and the dragon is crushed under Jesus’ feet…all for you. Then, with a loud voice, Jesus cries out into the tomb: Lazarus, come out. And the man who had died came out, his hands and feet bound with linen strips, and his face wrapped with a cloth. Jesus said, Unbind him, and let him go. Jesus says the same thing to us in our guilt, suffering, and death: Unbind him. Let him go. Dear baptized Christian, come out. Arise! 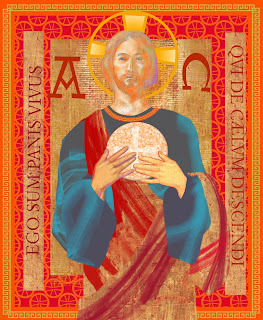 Lenten Midweek Sermon: "I AM the Bread of Life"
It’s good nutritional advice to be sure, but more than that, there’s Scriptural wisdom in those words. Jesus’ declaration, I AM the Bread of Life takes us all the way back to Genesis. Bread is a food of the Fall. East of Eden, bread takes work. Seeds are sown. The farmer harvests. The miller grinds. The baker bakes. The truck delivers. The shelves are stocked. The grocer sells. Then we buy and eat. It’s one big sweaty mess. And even after all that work there’s still something missing in Adam’s bread. This bread can’t rescue us from Sin or Death. This bread fills us one moment, and leaves us hungry the next. This bread doesn’t last. We spend our lives chasing after bread that spoils and food that can’t save. Bread is a sign of our mortality; it comes from the earth and feeds our bodies which will one day return to the earth. Bread also makes an appearance in the Exodus. YHWH provided Bread from heaven. The food of angels, they called it. Behold, I will rain bread from heaven for you, declares the Lord, and the people shall go out and gather a day’s portion for every day. Israel didn’t have to work for this bread. No labor, planting, or harvesting. No sweaty brows, calloused hands, or sore backs. All they had to do was go outside their tents and there it was. Manna in the wilderness. YHWH provided just enough for each day, no more, no less. And yet Israel still grumbled against the Lord: We loathe this worthless food. Why did you bring us out into the wilderness to die? Would that we were in Egypt where sat by the meat pots and ate bread to the full. Bread couldn’t save Adam. The bread from heaven God gave through Moses couldn’t save Israel either. And neither will Adam or Moses save us. For like Adam, we have hungered and thirsted for self-righteousness; we have labored to fill our bellies with the food of this world; we cannot live by bread alone. Like Israel we’ve grumbled and groaned against God’s grace; we’ve pushed aside the Lord’s bread to get all we can eat at the world’s buffet; we foolishly think that slavery in sin looks more appetizing and satisfying than the bread of life God offers freely. As Jesus tells the crowds in John 6, Your fathers ate manna in the wilderness, and they died. That’s the problem. Like Adam and Israel, we eat bread to our death. Ordinary bread won’t save us. The bread that Jesus gives, however, is completely different. 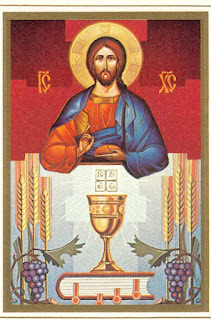 I AM the Bread of Life, Jesus declares. And each time he says it, the flavor of his words intensifies. I am the bread of life. Your fathers ate the manna in the wilderness, and they died. This is the bread that comes down from heaven, so that one may eat of it and not die. On the cross, Jesus devoured our grumbling and traded our groaning for rejoicing. 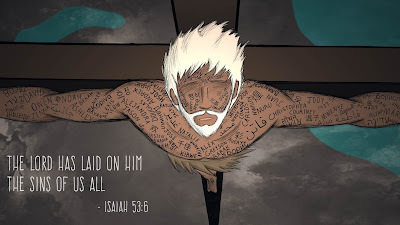 By the sweat and blood of his brow, Jesus labored under the weight of our sin for you; he suffered and wrestled with thistle and thorn on the cross for you. And then he returned to the dust of the earth for you. Jesus swallowed Adam’s bread of death in order to give you the Living Bread of his flesh and raise you to life. And now when we come to the Lord’s Supper we have the same promise: Whoever feeds on my flesh and drinks my blood has eternal life, and I will raise him up on the last day. For my flesh is true food, and my blood is true drink. 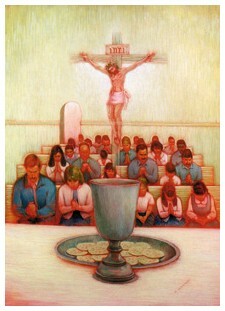 Jesus takes the food of the Fall, fills it with his death and resurrection, and turns it into a feast of forgiveness. This Bread is the medicine of immortality, a cure for death. This Bread has the power to raise you to life from the dead. 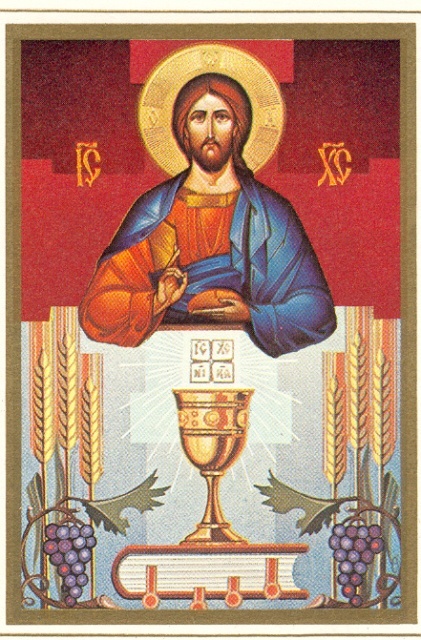 This Bread will never perish, and in eating and drinking, guarantees that you will never perish either. Jesus is our Bread of Life. Jesus is our true Manna in the wilderness. Jesus is the Bread that the Father gives at great cost to Him and no cost to us. I AM the Bread of Life. 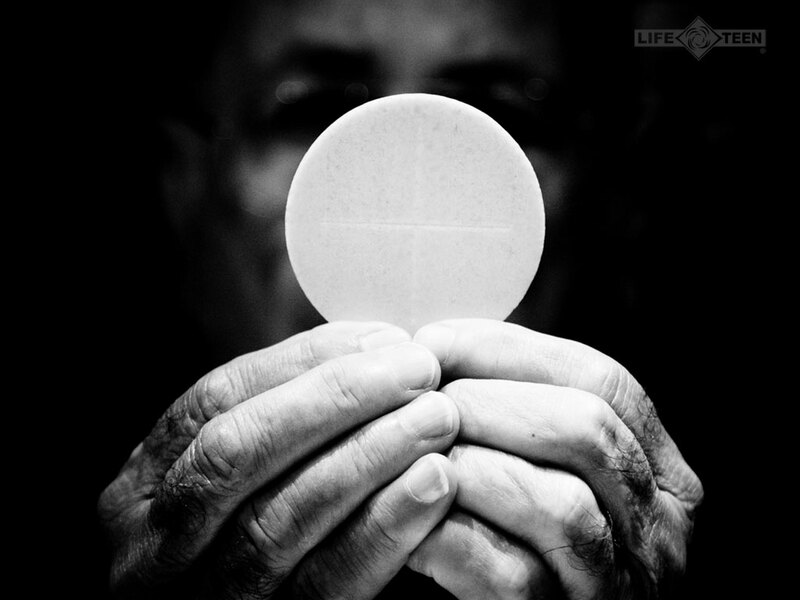 Whoever feeds on my flesh and drinks my blood abides in me, and I in him. Lenten Midweek Sermon: "I AM the Vine"